I lied in the title, because “rage face” and all the other memes from 2010 are still around, and people are still trying to cash in on them. 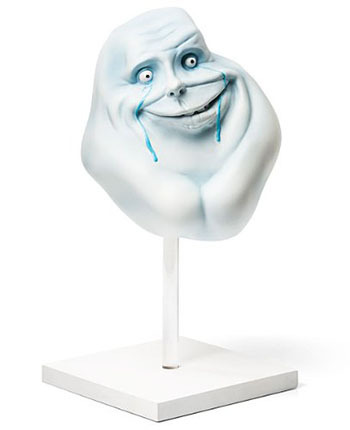 Do you want a “Forever Alone” statue for your desk? If you’re a dipshit, yes, and sure. How about a “Trollface” bobblehead? You can tap it, and watch it shake while you exchange low-grade arguments with other posters on Aggro-Gator, or whatever cesspool of stupid images you prefer. Slip on your giant cardboard Rage Face and life your best life, like a vision board from The Secret, only full of memes. It’s your life and you want to fill it with the bottom of the Internet’s big barrel. None of these memes are to be confused with Meme The Midget Inflatable Love Doll, of course.